I was going through some of my old pictures today and I found some that I took before I started my blog. I don't intend to really write any of them up as individual posts, but I thought people might be interested in seeing them to get ideas. If you want to see them in a bigger size just click on the picture. 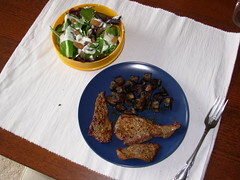 Steak, mustardy mushrooms, salad with almonds and I think tahini dressing. 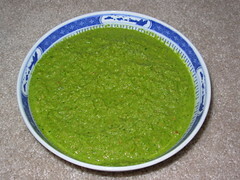 Blended salad soup. It was, um, an experiment. An experiment gone horribly awry. 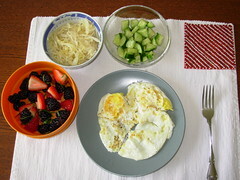 Fried eggs, blackberries and strawberries with mint, sauerkraut, cucumbers with a drizzle of olive oil. 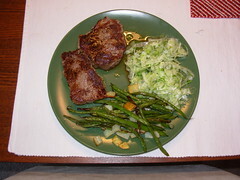 Ribeye steak, raw fennel salad, roasted green beans and potatoes. 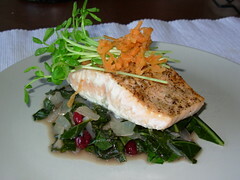 Salmon on a bed of collards cooked with onions and cranberries, garnished with grated carrots and pea shoots. I remember trying to make this picture look fancy but I don't remember why! 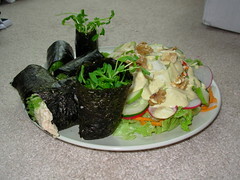 Tuna salad and pea shoots wrapped in nori seaweed and a salad with walnuts and tahini dressing. 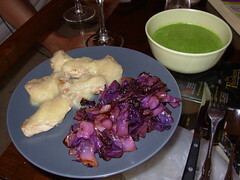 Pork tenderloin with cinnamon applesauce, sauteed red cabbage, parsley soup. I remember my applesauce recipe for this was awesome (maybe I'll dig it out and post it), but the parsley soup was kind of gross. 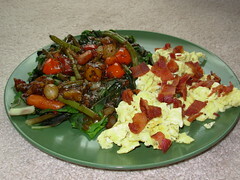 Scrambled eggs topped with bacon and a side salad topped with Trader Joe's balsamic frozen veggie mix. 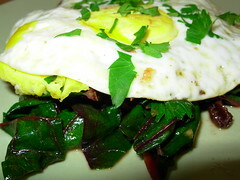 Fried egg with parsley on top of braised swiss chard. 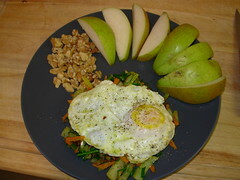 Fried egg on top of sauteed mixed veggies, walnuts and a pear. I always check in for the latest dinner ideas, and there are some good ones here. Oh and last night we used your almond meal crackers recipe from about two months back to make a really tasty taco salad (there was a bit of cheese and sour cream involved, so not 100% paleo). Because we used the store bought finely milled almond meal, they came out a little differently than they had before. They tasted like pita chips, in a good way, but we also made them thicker than last time. Anyway, it was a hit so thanks for the recipe! You take the best food pics. That really made me hungry! :) Thanks for sharing. I think it's great that you are totally honest! Even if a recipe comes out bad, you aren't afraid to admit it. 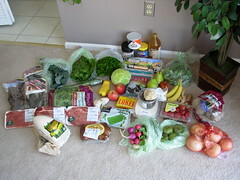 You are so creative, I love checking out what you are cooking up!